US officers have been buying back stolen computer drives, many of which contain sensitive military data, from an Afghan market near a key airbase. Shopkeepers in the bazaar, next to the Bagram airbase outside Kabul, have been selling the finger-sized "flash drives" reportedly stolen from the facility. An inquiry has begun into how security was breached at Bagram. 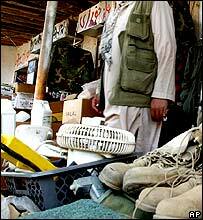 Shopkeepers said the drives were stolen by Afghans employed at the base as cleaners, office staff and labourers. US military spokesman Lt Mike Cody said he could not comment on the reports because an investigation was under way. 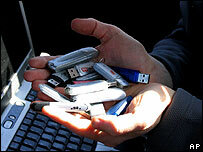 About 40 of the drives on sale at the market were reviewed on a computer by news agency Associated Press. It said most of them were blank or did not work, but three contained data, including troop CVs and photographs of Air Force One during President George W Bush's recent visit to Afghanistan. One shopkeeper said soldiers went around the market carrying "a box full of afghanis [the Afghan currency], buying all they could find". "They said they wanted them all and price wasn't important," he told AP. In earlier reports, the Los Angeles Times said the drives contained the names of allegedly corrupt Afghan officials, reports on enemy targets and details about US defences. AP said some drives it had seen previously contained the social security numbers of hundreds of soldiers, including four generals, and lists of troops who had completed nuclear, chemical and biological warfare training. The computer drives were on sale alongside other items, apparently also from the Bagram base, including US military uniforms, compasses, binoculars sunglasses and knives.